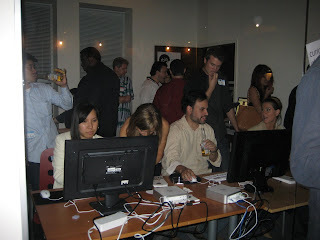 ThisNext, an online site full of user generated product recommendations, had a party the other night at their offices in Santa Monica and invited bloggers and their community users. They gave away some prizes (I didn't win any), including a Vespa scooter (dang!). There was a DJ and for food they had some grilled cheese sandwiches, fried risotto balls and cupcakes from Vanilla Bake Shop (I can't escape cupcakes it seems). Also, of course there was an open bar where I tried a raspberry EmergencC cocktail with EmergencC water. I ran into blogger Caroline on Crack, Ask Fashion Kitty and Malissa from Dogeared jewelery who gave me a Make a Wish necklace, which consists of a gold dipped karma charm on a string of thread and when it eventually wears off and breaks, your wish comes true. I picked the necklace with a feather charm on it, pretty cute idea, like a modern day and more elegant friendship bracelet. I especially like that you can barely feel that it's even on. On the swag front, ThisNext gave out take-out Chinese food boxes to each parting guest with stickers, a fortune cookie and a mimobot, a cartoon looking hi-speed USB stick, mine looks like a Monsters Inc monster. So glad you could make it to the party!